Eastman School of Music faculty members, students, and alumni will join the worldwide observance of Yom HaShoah by performing a Holocaust Remembrance Concert entitled “A Time to Remember,” on Sunday, May 5, 2019, at 7:30 p.m. in Kilbourn Hall. 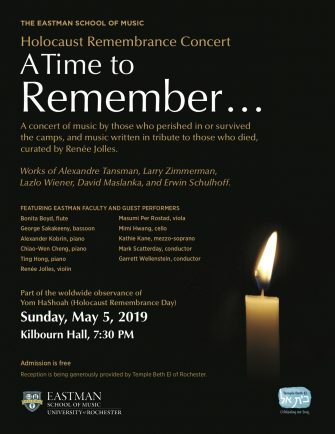 The concert features music written by those who perished or survived the World War II concentration and work camps, as well as music written in tribute to those who died. The series of annual concerts was launched in 2014 by Professor of Violin Renée Jolles. Her father, Jerome Jolles, buried bodies as part of a work detail in Romania during the Nazi occupation. He survived and came to the United States, where he finished his studies at Juilliard in music performance and composition. A virtuoso accordion player, piano teacher, and composer, Mr. Jolles died in January 2014. The concert will feature the Suite for Bassoon and Piano by Alexandre Tansman, a Polish-Jewish composer who fled the Nazis in 1941, as well as Larry Zimmerman’s Windsongs: for the children of Terezin, a song cycle set to poems of the children of Terezinstadt, the infamous death camp of Czechoslovakia. 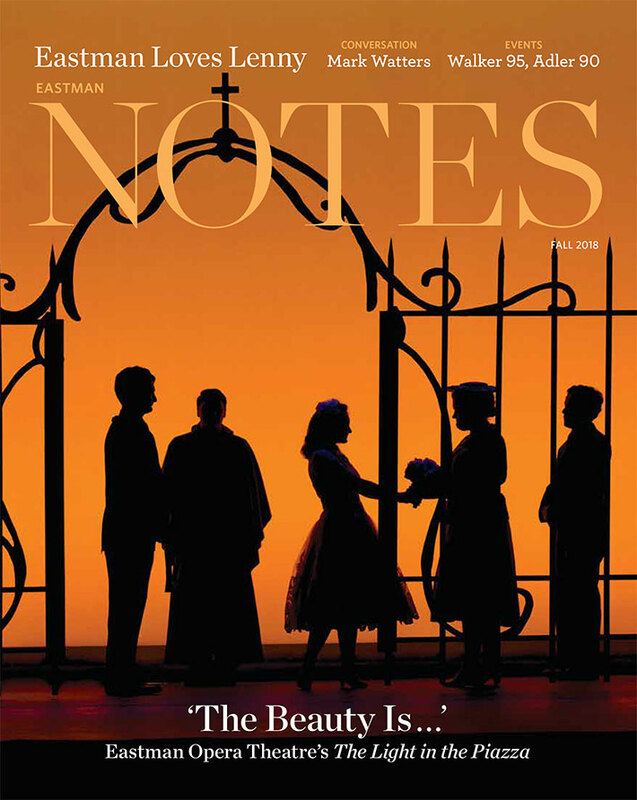 The program also features rarely performed works of Lazlo Wiener and Erwin Schulhoff, who perished in the Holocaust, as well as David Maslanka’s Remember Me for solo cello and nineteen players which was inspired by a horrific Holocaust event involving the extermination of 5,000 Jews in a small town. Performers include Eastman faculty members and guests: Bonita Boyd, flute; George Sakakeeny bassoon; Alexander Kobrin, Chiao-Wen Cheng, and Ting Hong, piano; Renée Jolles, violin; Masumi Per Rostad, viola; Mimi Hwang, cello; Kathie Kane, mezzo-soprano; and Mark Scatterday and Garrett Wellenstein, conductors. Open to the Public, new this year, admission to the “A Time to Remember . . .” concert is free. A reception provided by Temple Beth El of Rochester will be held after the concert in Cominsky Promenade.